Little companion. Netbooks still have a purpose. A small, light, and portable Windows device does not have to be expensive. But what can the buyer expect for a price below 250 Euros (~$310)? It seems unfair to be too harsh on a laptop which costs a measly £175, but such a low price isn't the headline-grabbing feature it once was. There are plenty of excellent rivals available for similar money - not least the HP Stream 11 - and the Acer just isn't consistently good enough to win itself an award. If battery life is a prioroty, however, we wouldn't rule it out completely. 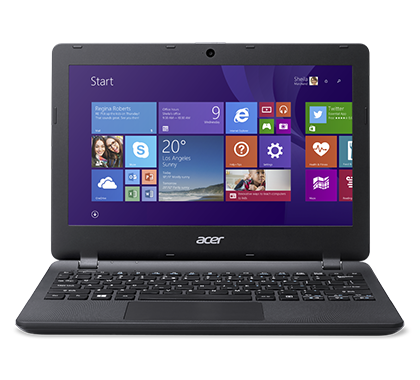 Model: The Acer Aspire ES1-111-C56A is a lightweight, functional laptop with good build quality. Design is kept simple with the entire laptop sporting a matte dark gray chassis. The top cover has a unique texture and sports the Acer branding towards the left side. Input devices come in the form of an island style keyboard, which can feel spongy at times and a comfortable looking trackpad. The Acer Aspire ES1-111-C56A is equipped with an 11.6 inch 1366 x 768 pixels display, which is sufficiently clear with good saturation. An Intel Celeron N2840 dual-core processor powers the Windows 8 system. Moreover, the Acer Aspire ES1-111-C56A comes with an Intel Graphics GPU, 2 GB of DDR3L RAM and a 32 GB SSD as internal storage. These components allow a low-end price. Audio quality is decent with the stereo speaker setup and the laptop comes with an integrated webcam for basic video calls. Other features found on the laptop are two USB 2.0 ports, a USB 3.0 port, a card reader, Bluetooth 4.0 HS, and an HDMI out. A 3-cell Lithium Polymer cell makes for battery life.